In this part we will explore the meaning of the 55th Shloka of Sri Vishnu Sahasranamam. Bhagavan sustains life and is the Saviour. He is an/the Antaryami and resides within all of us, as Saakshee or witness, remaining as an observer to protect us. 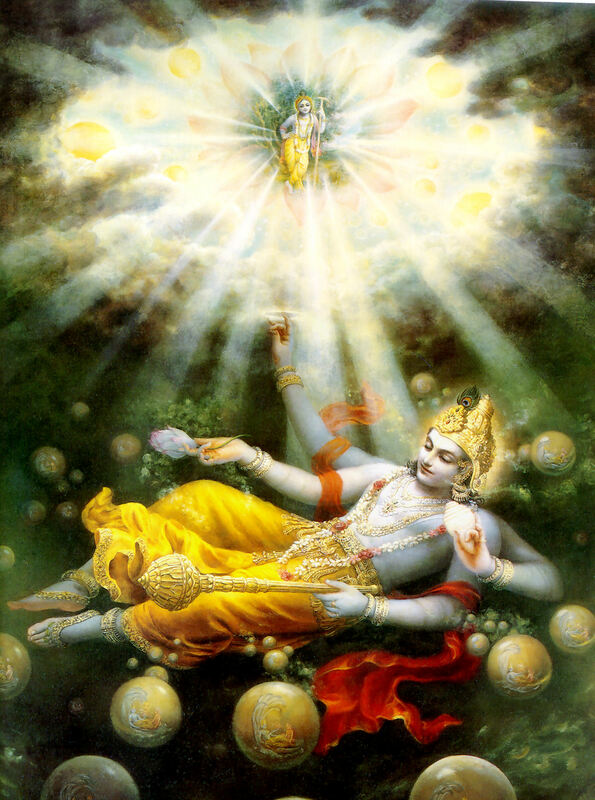 He is the bestower of Moksha or Liberation. He is of boundless Valour. 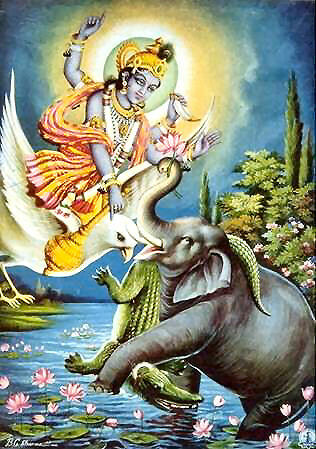 He has unlimited power and strength; and He supported the World in the form of a Tortoise (Kurma Avataar). 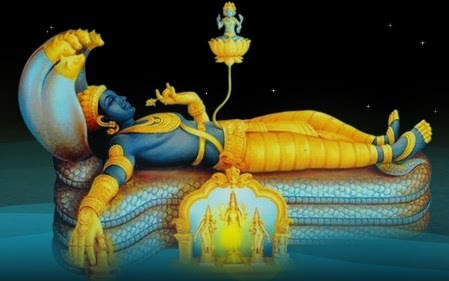 He is the Inner Soul of Ananta (the Serpent) on/upon which He is seen… He is seen reclining on the Vast Ocean. He causes dissolution by assuming the form of Sankarshana (Rudra) and later assumes the Yoga Nidhra form waiting for the appropriate time to recreate the Universe. According to Sri Adi Sankara this Nama means ‘Praanaan kshetraroopena dhaarayan Jeevah uchyate – He supports life in the form of the root or underlying body and hence He is called Jeevah’. Life needs a medium to exist and the body or kshetra is that medium. Bhagavan is the provider and carrier of the basic fabric of life and so He is called Jeevah or the Life sustainer. Sri Parasara Bhattar interprets that Bhagavan helps His devotees to keep away from committing sinful acts and thereby help them lead a life of bliss by engaging in His Kainkaryam or service. Meaning: Know that this sacred temple (the body) where my Lord is a fortress and He is on guard. He is on my mind at all times guiding me to righteous actions that will ensure no rebirth! Sri Satyadevo Vasishta gives the more general interpretation viz. that Bhagavan is the cause of sustenance of everything – Jivayati praanaan dhaarayati iti Jivah. Meaning: This body, O son of Kunti, is called the field, and one who knows this body is called the knower of the field. Sri Adi Sankara gives two different interpretations for this compound Nama – ‘Vinayitaa-Saakshee’. The first is ‘Vinayitvam Vinayitaa taam cha saakshaat pashyati prajaanaam iti VinayitaaSaakshee – Vinayitaa means humility and Saakshee is an eye witness; hence, He is called VinayitaaSaakshee because He is an eye witness to the humility of people’. The import is that he can see through the real nature of people and can easily distinguish between those who are genuinely humble and those who only pretend to be so. Sri Adi Sankara’s second interpretation is ‘Athavaa nayater gativaachino roopam Vinayitaa, Asaakshee asaakshaat drashtaa Aatmaatiriktam vastu na pashyati iti – He does not perceive anything outside of himself’. Since He is all pervasive inside and outside of every object there is nothing to perceive outside Him. Sri Parasara Bhattar derives the interpretation for ‘Vinayitaa’ from the root ‘nay’, which has two meanings – ‘gatau rakshane ca – to go or to protect’. Sri Bhattar uses the second of the two meanings. He states that Bhagavan protects His devotees with love and affection and treats them like a Prince – Rajakumara laalanena rakshati. Such was the concern and love that He had for the Vanara King. சாலப் பலநாள் அடியேன் இன்னம் தளர்வேனோ? Meaning: O’ Lord who protects all through every age, we see you walking, standing, sitting and lying. O’ Lord who is seated with beautiful Goddess Lakshmi on a Lotus beside Him, how many days must I live in this separation from You? Sri Satyadevo Vasishta bases his interpretation using the first meaning given above for ‘nay’ meaning ‘to go’. His interpretation is – Sarvasya jagato gatim praayayitaa gater-daataa ityarthah – He shows the path to everyone, or gives direction to everyone. Bhagavan is the Observer within each one of us. Sri Parasara Bhattar’s interpretation is that Bhagavan is so concerned about the welfare of His devotees that He constantly observes them to make sure no harm comes to them. Meaning: O Lord, You reside in every heart and are ready to guide the erring souls. You are witness to every thought that passes in every mind. The pretender that I was I did not feel this divine presence when I served as the temple servant in devotional service. But when I realised that you are a witness to all the goings-on, I felt ashamed and laughed at my folly of having thought I had deceived you. Sri Adi Sankara and Swami ChinmayAnanda have interpreted the Namas 516 and 517 together as one Nama – Vinayitaa-Saakshee – He who witnesses or observes the humility of His devotees. The conversation between Lord Krishna and Uddhava brings out the meaning of the Nama Saakshee brilliantly. From his childhood, Uddhava had been with Krishna, riding his chariot and serving him in many ways. He never asked for any wish or boon from Sri Krishna. When Krishna was on the verge of completing His Avataar, he called Uddhava and said, ‘Dear Uddhava, in this Avataar of mine, many people have asked and received boons from me; but you never asked me anything. Why don’t you ask something now? I will give you. Let me complete this Avataar with the satisfaction of doing something good for you too’. 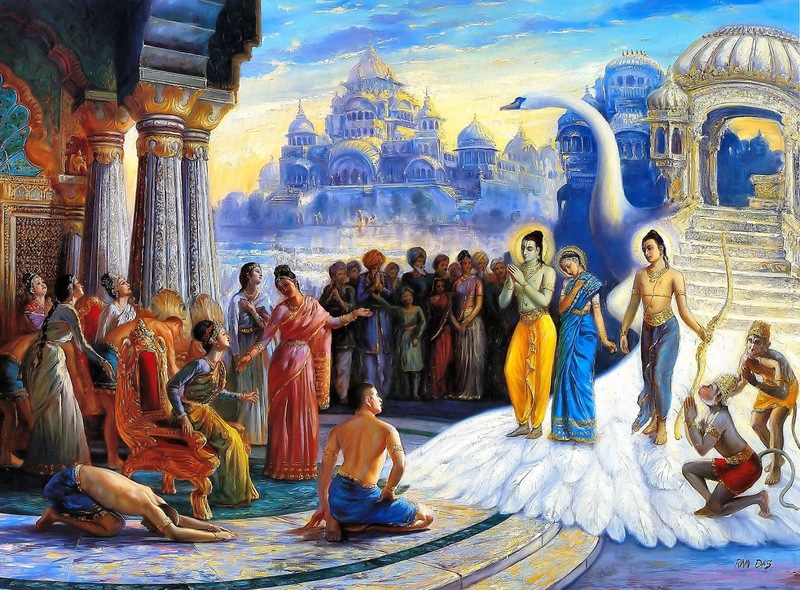 Uddhava poses several questions to Lord Krishna. Uddhava: ‘Krishna, you were a dear friend of the Pandavas. They trusted you fully as Apadhbhandava (protector from all difficulties). 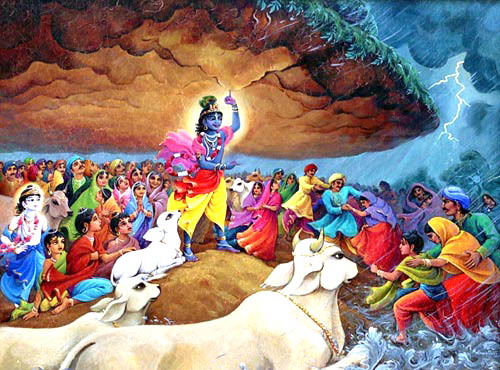 Krishna, you not only know what is happening, but you know what is going to happen. Why did you not act by the definition of a true friend? Why did you not stop Dharmaraj (Yudhishtra) from playing the gambling game? As Uddhava posed these questions, tears started rolling from his eyes. All of us who have read Mahabharata have these questions. Bhagavan Krishna laughed. ‘Dear Uddhava, the law of this world is ‘Only the one who has Viveka (intelligence through discrimination), wins’. 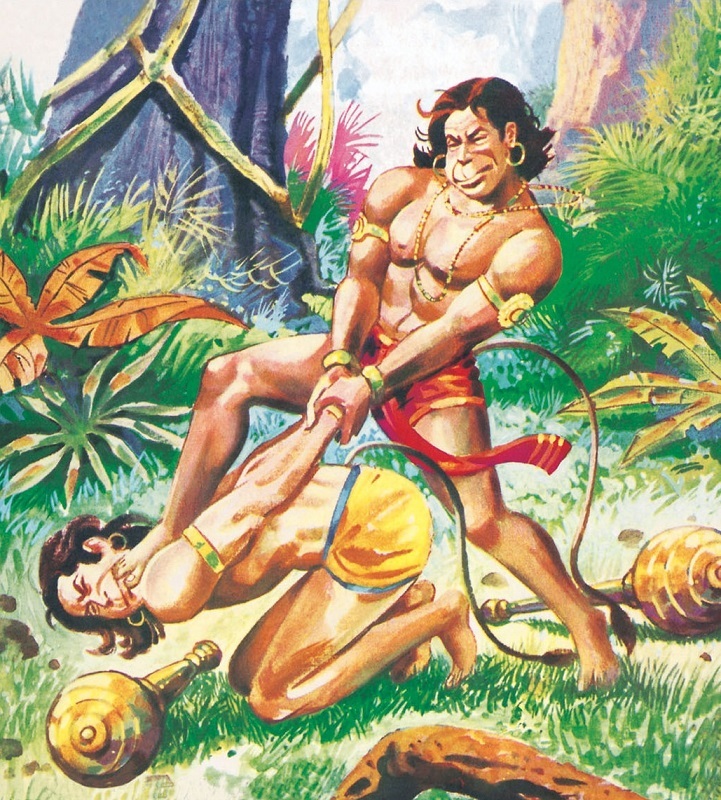 While Duryodhana had Viveka, Dharmaraj lacked it. That is why Dharmaraj lost’. Uddhava was lost and confused. Krishna continues ‘While Duryodhana had lots of money and wealth to gamble, he did not know how to play the game of dice. That is why he used his Uncle Shakuni to play the game of dice. To be aware of one’s strength and limitations is Viveka. Dharmaraj could have also thought similarly and offered that I, his cousin, would play on his behalf. If Shakuni and I had played the game of dice, who do you think would have won? I can forgive the fact that he forgot to include me in the game. But, without Viveka, he committed another blunder. He prayed that I should not enter the hall as he did not want me to know that he was about to gamble. He tied me with his prayers and did not allow me to enter the hall; I was just outside the hall waiting for someone to call me through their prayers. When Bheema, Arjuna, Nakula and Sahadeva were lost, they were only cursing Duryodhana and brooding over their fate; they did not think of calling me for help. Even Draupadi did not call me when Dushasana dragged her by the hair acting on Duryodhana’s orders. She was also arguing in the hall relying on her own abilities. Finally good sense prevailed on Draupadi when Dushasana started disrobing her. She gave up depending on her own strength and sought help shouting ‘Hari, Hari, Abhayam Krishna, Abhayam’ and called for me. Only then, I got the opportunity to enter the hall and save her modesty. I reached as soon as I was called and saved her modesty. What is my mistake in this situation? ‘Wonderful explanation, Krishna while I am impressed, I am not deceived. Can I ask you another question’, says Uddhava. 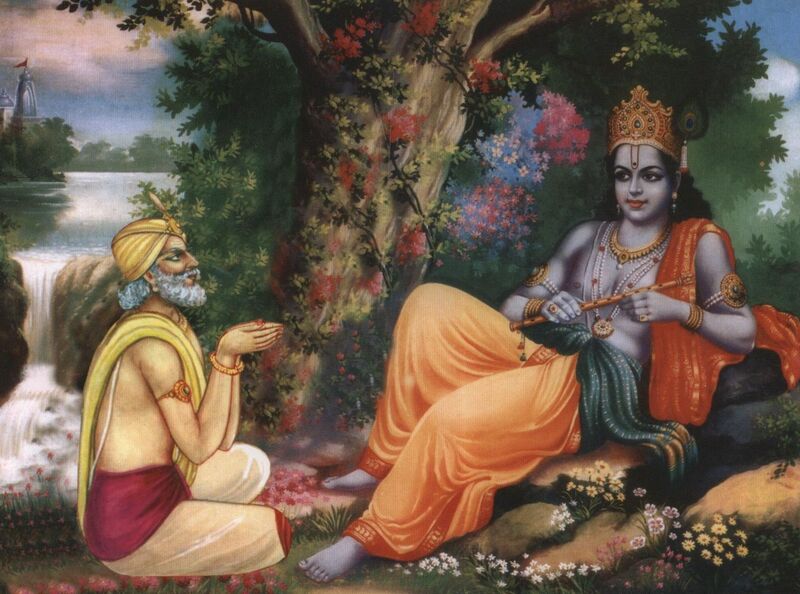 Krishna gives him the permission to proceed. ‘Does it mean that you will come only when you are called? Will you not come on your own to help people in crisis, to establish justice?’ asks Uddhava. Krishna smiles. ‘Uddhava, in this life everyone’s life proceeds based on their own Karma. I don’t run it; I don’t interfere in it. I am only a ‘Saakshee or a Witness’. I stand close to you and keep observing whatever is happening. This is God’s Dharma’. Uddhava says, ‘Wow, very good Krishna. In that case, you will stand close to us, observe all our evil acts; as we keep committing more and more sins, you will keep watching us. You want us to commit more blunders, accumulate sins and suffer’? Krishna says.’Uddhava, please realise the deeper meaning of your statements. When you understand and realise that I am standing as Saakshee or Witness next to you, how can you do anything wrong? Uddhava was spellbound and was overwhelmed by Bhakti. He said, ‘What a deep philosophy. What a great truth! When we start believing that nothing moves without Him, we can feel his presence as Saakshee. How can we forget this and act? This Nama explains that Bhagavan is residing within all of us as Saakshee (Witness) and when we realise this we are bound to act in accordance with Dharma. Both Sri Adi Sankara and Sri Parasara Bhattar explain this as ‘Muktim dadaati iti Mukundah – One who gives Moksha or liberation to His devotees’. Both have referred to the Panini Sutra 6.3.109 – ‘Prashodaraadeeni yathopadishtam’ to support the derivation of the word ‘Mukunda’ from ‘Muktim dadaati’. The elision, augment and mutation of letters have to be seen in the context of Prashodara, while not found taught in treatises of grammar, are valid, to that extent and in the mode, as taught by the sages”. Meaning: In the blessed Ayodhya, the land created by Brahma, down to the grass and insects without exception, he gives an exalted place to all the sentient and the insentient, so would any scholar study about a King other than Rama? Sri Adi Sankara gives two explanations for this. The first is ‘Amitaa Aparicchinnaa Vikramaah trayah Paadavikshepaah asya – He whose three foot-steps were huge and immeasurable’. This refers to the Bhagavan’s Vaamana (and Trivikrama) Avataar in which He conquered Mahabali with his three gigantic foot-steps. 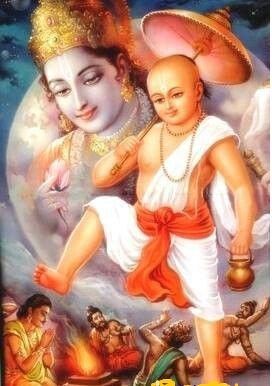 The second interpretation is ‘Amitam Vikramanam Shauryam asya iti vaa – He has unlimited strength, power and might, hence He is called Amitavikramah’. In this context the word ‘Vikrama’ is used to mean Paraakrama or Strength, Courage, Valour and Power. Sri Parasara Bhattar’s interpretation is that Bhagavan is the Supporter of all Realities such as Prakriti. He is known by the Nama Adhaara Shakti – Adhaara Shakti samjnasya amrutasya ca vai vibhoh (Sri Paushkara) – ‘The Lord is of inestimable capacity to bear’. Meaning: O’ embodiment of All, My Obeisance’s from the front, back and all sides! O’ unbounded power, You are the master of limitless might and are all-pervading; thus You are everything! Sri Satyadevo Vasishta explains that the root ‘kram – paadavikshepe’ meaning ‘to walk or to step, is the basis for the derivation of his interpretation that Bhagavan has innumerable or countless strides in His manifestations. This diversity or extensive manifestation is also reflected in everything around us – the Earth, the Sky, and the region in between; Rajas, Tamas and Sattva Gunas; Sunrise, mid-day, and the Sunset; etc. Sri Adi Sankara gives two interpretations for this Nama. The first is ‘Ambhaamsi devaadayah asmin nidheeyante iti Ambhonidhih – All the entities called Ambhas (Devas and others) reside in Him, hence He is called Ambhonidhih’. This interpretation is based on a verse from Taitriya Bramhana (2.3.8) which says ‘Taani vaa etaani chatvaari Ambhaamsi; Devaa Manushyaah Pitaraah Asuraah – There are 4 Ambhas namely Devas, Humans, forefathers and Demons’. Sri Sankara’s second interpretation is ‘Saagaro vaa – He is the Ocean or the abode of water’. He is called the Ocean because He is symbolic of the Ocean for its immensity, colour and ability to sustain life. In the Bhagavad Gita (Chapter 10 Verse 24) Lord Krishna says ‘Sarasaam asmi Saagarah – I am the Ocean among reservoirs of water’. Sri Parasara Bhattar interprets this Nama to represent Bhagavan’s Kurma Avataar. He says ‘PaataalAmbhasi Akhila-jagadhaara-peetha nidhIyate iti ambhonidhih – He kept His form as a Tortoise in the waters of the Paataala Loka as the base plank to support the Samudra Manthan. The mantra quoted by Sri Bhattar in support of this is ‘Ananta bala Saktaye bhuvanabhrute KacchapAtmane – He has unlimited power and strength; and He supported the World in the form of a Tortoise (Kurma Avataar)’. The Dharma Chakram writer points out that while these Ambhas are the ones who control the rest of the life forms, Bhagavan controls the Ambhas, and thus He controls everything. 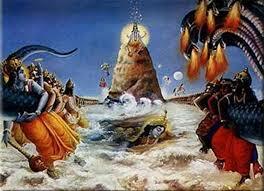 Bhagavan also supports the life forms as Kurma Murti when everything gets submerged under the water during Pralaya. Thus, this Nama signifies that Bhagavan is the Support of all life forms at all times. Sri Satyadevo Vasishta explains that Bhagavan establishes (Nidhaanam) water in various forms and with various attributes and sustains life – the blood stream running in several life forms, the water that seeps through the root from the earth to sustain the trees and other plant forms, etc. Water is one of the essential elements for sustenance of life. He gives reference from Rig Veda (8.44.16) – Apaam Retaamsi Jinvati. Sri Adi Sankara interprets this as ‘Deshatah Kaalato Vastutah cha aparicchannatvaat Anantaatma – He has no limitations of space, time or matter hence He is called AnantAtma’. He is present everywhere. He exists at all times without a beginning or an end. He penetrates all matter. Boundaries regarding space, time or matter do not exist for Him. Sri Parasara Bhattar interprets the Nama as referring to Bhagavan being the Inner Soul of Ananta, who bears the Universe standing on top of the Kurma. 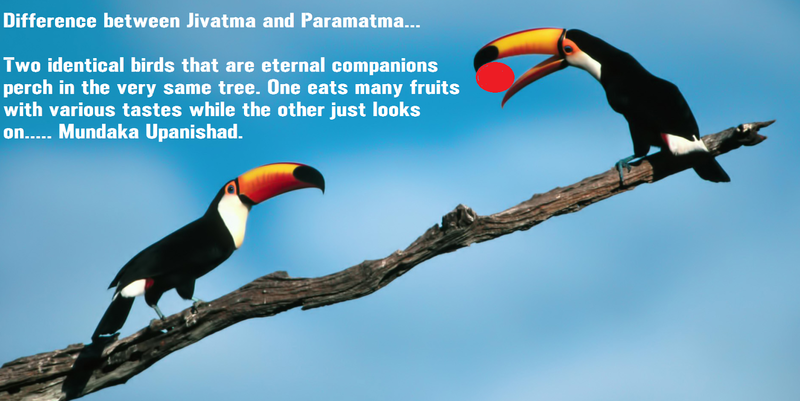 Sri Radhakrishna Shastri elaborates on this further by observing that for all objects in this Universe, if they are in one place they can’t be in another place, and if they are in one form they can’t be in another form at the same time. Bhagavan is not subject to these constraints, signified by the Nama AnantAtmA. Sri Adi Sankara interprets this as ‘Samhritya sarvabhootaani ekaarnavam jagat kritvaa adhishete mahodadhim iti – After disintegrating the whole Universe at the time of the final deluge reduces everything into one Ocean and reclines in those primeval waters’. After the final dissolution, what is left is a huge Ocean and Bhagavan takes Yoga Nidhra or Yogic slumber on those waters till the time is ripe for Creating the Universe again, hence He is Mahodadhishayah. துள்ளம் சோரத் துயிலணை கொள்ளேன் சொல்லாய்யான்உன்னைத் தத்துறு மாறே. Meaning: O’ Lord reclining in the Milky Ocean on a serpent-couch in feigned sleep! In the hope of having a beatific vision of you, my heart melts, my words fail, my hairs stand on their ends, and my eyes shed fine tears. I cannot go to sleep. Pray tell me, how am I to reach you? Meaning: My Lord is present in all beings and in all the things; and He is beyond comprehension. 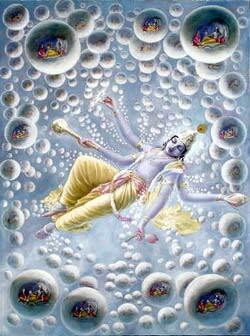 He is Lord Krishna who swallowed all and recreated everything in His Leela (sport). He churned ambrosia from the Ocean and bestowed it on the Devas. He is Achyuta, Ananta and Govinda, reclining on the Serpent Couch. Swami ChinmayAnanda suggests that the Nama can also be interpreted as referring to Bhagavan reclining on a fig-leaf on the waters after the deluge (Aalai ilai Mel Palli Kondaan). Sri Adi Sankara interprets this as ‘Antam karoti bhootaanaam iti Antakah – He causes the end of all beings, hence He is called Antakah’. From time to time Bhagavan destroys His Creations just to rebuild again so He is a Destroyer apart from being the Creator. Sri Parasara Bhattar gives several references to support his interpretation. He quotes from Ramayana – ‘Ante prithivyAm salile drishyase tvam mahoragah – ‘At the time of the end of this world, You are seen on the AdiSesha in the waters of the deep’. Meaning: At the end of the Kalpa, assuming the form of Rudra with His mouth emitting mammoth Fire, He devours the three worlds. Meaning: He swallows all things and all beings and contains them within him easily. He is of eternal effulgence reclining on the Ocean, He alone is my Lord! 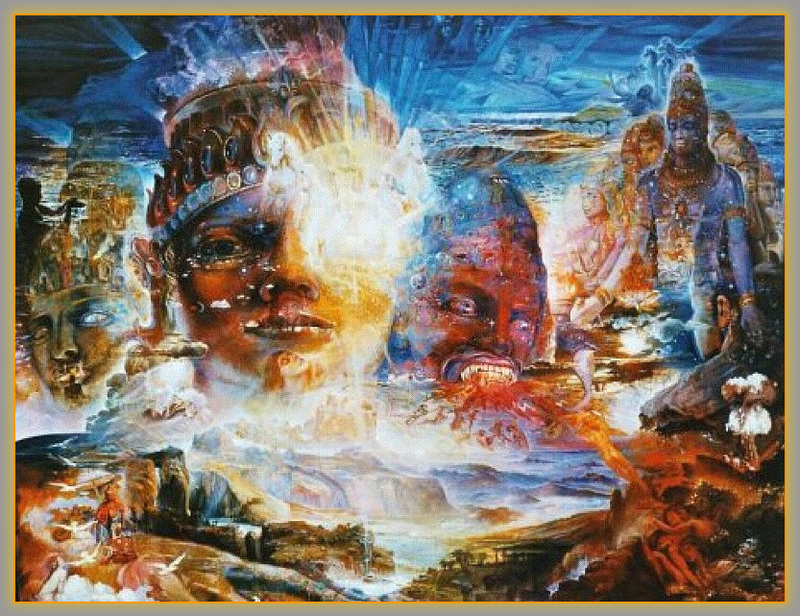 Swami ChinmayAnanda explains that Bhagavan as Time brings about constant changes in this world without which no evolution or creative development is ever possible, and in this sense He is Antakah. Bhagavan sustains life and hence He is Jeevah. He is Vinayitaa as He is the Saviour. As Saakshee He resides within all of us and as an Observer He is there to protect us when we realise His presence. 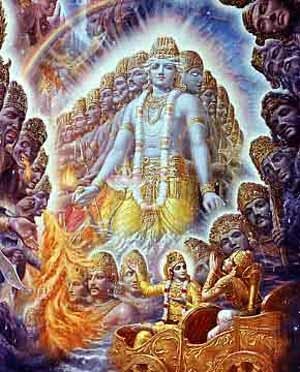 He is Mukundah as He is the bestower of Moksha or Liberation. He is of boundless Valour with unlimited power and strength; hence He is Amitavikramah. He supported the World in the form of a Tortoise (Kurma Avataar) by staying in the Water and hence He is Ambhonidhih. He is the Inner Soul of Ananta (the Serpent) and hence He is called AnantAtma. He is seen reclining on the Vast Ocean after causing dissolution by assuming the form of Sankarshana (Rudra), so He is Mahadadhishayah. He is Antakah as He swallows everything and assumes the Yoga Nidhra form waiting for appropriate time to Recreate the Universe. when you wrote the shloka in english it is written 64th shloka but it is 55th pls change it in both place. the lines from the Uddhava Gita sums it up quite well ” in this life everyone’s life proceeds based on their own Karma. I don’t run it; I don’t interfere in it. I am only a ‘Saakshee or a Witness’. I stand close to you and keep observing whatever is happening. This is God’s Dharma ” .. thanks for this. The commentary for Mukundam by you is more elaborate and meaninful, rich than all published hitherto. கயிற்றும் அக்காணி கழித்து இதற்கான உரையில் ஸ்ரீ காஞ்சி பிரதிவாதி பயங்கரம் அண்ணங்கராசாரியார், கயிறு- நரம்பு; அக்கு- எலும்பு, ஆணி- சரீரத்துக்குப் பெயர். ஆணி கழித்தல்- சரீரத்தில் தசையை ஒழித்தல். எலும்பில் இருந்து மொத்தமாக தசைகளை நீக்கும் ஆற்றல் பெற்றவனாய் ஆண்டவனைச் சொல்கிறார். அதாவது ஆதாரம் என்ற பொருட்படும் விதமாக ஆணி என்றால் தசை, எலும்புகளை ஒரு அமைப்பில் நிறுத்தச் செய்யவும் அவற்றை இயக்கவும் தேவைப்படும் தசைகள் என்று சொல்கிறார். Indeed, there are several interpretations. Thank you for adding another dimension 🙂 Hari Om! anantaatmaa One Who has no confines and limitations and has no end for His Being.